Of course, Morgan silver dollars are one of the most popular U.S. coin series, and many Morgan dollar issues represent the most valuable coins among commonly collected U.S. coins. So it make sense that several of the eBay Morgan dollar listings last month inspired some very spirited bidding. September saw some very impressive offerings for the Morgan dollar series. In fact, the most expensive Morgan silver dollar listing for the month received a whopping 123 bids! For the most part, 1893 Morgan dollars dominate the rankings for the Top 10 most expensive Morgan dollars, as well as an array of Carson City issues. Eight of the 10 most expensive Morgan dollars were sold in uncirculated grades, and eight were certified. So, without further adieu, I present the 25 most expensive Morgan dollars sold on eBay in September 2014. These prices are all realized prices, not original listing prices. 1895 Morgan silver dollar proof NGC PF 65 $54,100 – The most expensive Morgan dollar sold on eBay in September 2014 is also the absolute key coin that every Morgan dollar collector needs but few can afford. This 1895 dollar grades Proof 65 and is a truly pristine example of the date. 1894 Proof PCGS PR 67 $19,320 – Another proof Morgan silver dollar sold for big bucks on eBay in September, and this one is among the finest known. Bear in mind that proof Morgan dollars are generally rare, so a piece such as this, which grades PF 67 from PCGS, is a true spectacle to behold. 1893-S Almost Uncirculated “super tone, full breast” $15,101.01 – It’s no surprise than an 1893-S dollar winds up in a Top 3 spot among the most expensive Morgan silver dollars on eBay. This key date was minted in very small quantities (only 100,000 were made) and is scarce in any grade. 1893-S average uncirculated $12,100 – Another 1893-S near the top, this piece is billed as “average uncirculated” but sold for less than the “Almost Uncirculated” piece claiming the #3 ranking on this list. Notice that the 1893-S Morgan dollars in the #3 spot and here in the #4 ranking are listed without certification. Always beware when buying rare coins “raw,” for they may not be genuine or, at the very least, could possess problems that photographs may not well reveal. 1884-S MS 62 PCGS $11,774.00 – This seems like a fair price for a graded 1884-S Morgan dollar in the lower uncirculated grades. An MS-62, while not necessarily “premium quality” in the absolute sense, is still a tough grade for an old, large silver coin like the Morgan dollar. Remember, many Morgan silver dollars were stored for years in bank bags. 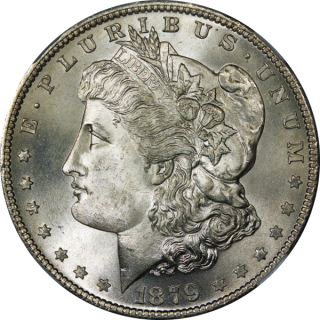 Relatively few Morgan silver dollars escaped unscathed, and most suffer serious bag marks, gouges, and other considerable surface detractions. 1879-CC PCGS MS 64 Capped Die Carson City “premium quality” $10,249 – This looks like a good price for a PCGS-graded 1879-CC Morgan dollar in a grade of MS 64. Any Carson City Morgan silver dollar is a treasure, and examples grading in mid-mint state grades such as this are real rarities. 1879-CC PCGS MS 64 Capped Die $9,300 – Perhaps this 1879-CC Morgan silver dollar, which is graded MS 64 by PCGS like the #6 dollar, suffered in price because it isn’t necessarily “premium quality” like the other 1879-CC offering mentioned here. At any rate, a truly Mint State 64 Morgan silver dollar makes a gorgeous addition to any coin collection. 1893-S PCGS XF 40 $8,900 – Any PCGS-graded 1893-S Morgan dollar that sells for less than $9,000 in today’s market is a great deal. There are many 1893-S Morgan silver dollars that have graded higher, but anybody would be proud to own a solid-XF 40 1893-S Morgan dollar in sonically sealed plastic. 1885-CC NGC MS 67 “gem graded” $8,499 – High-grade mint state Morgan silver dollars like this one are beautiful coins. Add a “CC” mintmark into the equation, and that Morgan dollar will sparkle in the eyes of die-hard numismatists even more. 1893-CC PCGS MS 62 $8,250 – This piece appears to have traded hands for a fair price. Again, MS 62 coins are generally not the most lustrous or most eye appealing, but an 1893-CC dollar bearing an MS 62 grade from a reputable third-party coin certification company is a fantastic addition to any Morgan dollar collection. Overall, the most expensive Morgan silver dollars sold on eBay in September 2014 are mainly key dates for the series. It's not surprising that most of these pieces are graded by PCGS (Professional Coin Grading Service) and NGC (Numismatic Guaranty Corporation). It's conventional wisdom that when buying rare coins online, you should only those that have been certified. The only exception to this rule is when buying rare coins from trusted coin dealers. The coins that make up the rest of this list of the 25 most expensive Morgan silver dollar coins on eBay are generally circulated key dates, though a few pieces are high-end examples of more common issues.